A new report by reseller Bank My Cell reaffirms the dramatic difference in resale value between Apple's iPhones and similarly priced premium Androids from Samsung, Huawei, LG, Sony, Lenovo, and others over the past year. Resale value is seldom considered by reviewers discussing the upfront price of a device. Yet for a major purchase like a $999 iPhone X, the fact that it only depreciated by 30 percent over the first nine months is a substantial factor in buying it. With a resale value of $690, buyers can trade in their existing model and apply the residual value towards the purchase of a brand new iPhone XS. 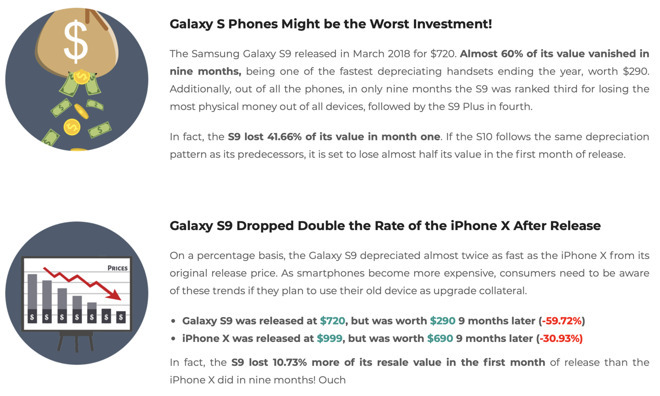 In contrast, over the same nine-month period from its debut, Samsung's Galaxy S9 crashed in value by 60 percent-- twice that of iPhone X -- leaving just $290 left in trade in value. The report noted, "In fact, the S9 lost 10.73% more of its resale value in the first month of release than the iPhone X did in nine months! Ouch." This year, Apple's latest iPhone XR, iPhone XS and iPhone XS Max models have similarly retained about 85 percent to 95 percent of their original sale value. Therefore, buyers who want to stay on the bleeding edge of Apple's technology curve can do so by trading up on a regular basis, rather than only throwing new money at every future model released. 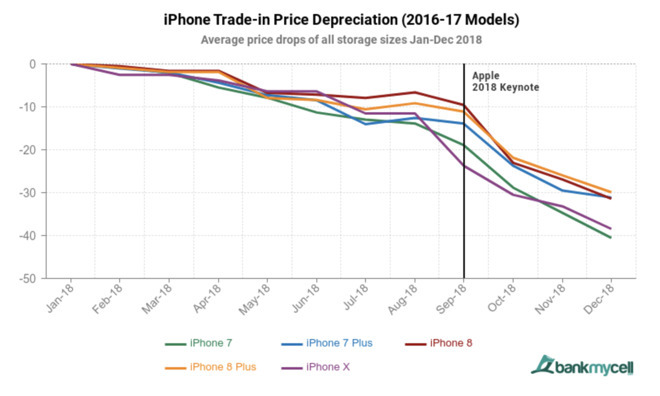 However, because so many users aim to trade in their iPhone for new ones, the market resale value also dips fastest just as Apple announces new models, usually in September. The report noted that "customers that take advantage of trade-in stores' 30-day price lock could have earned $100+ more selling an iPhone X before the event. Consumers should be aware that there is no obligation to send their device in, essentially they can lock the price and decide if they want the new phone after its announcement event." Apple's new iPhone announcements cause the fastest drop in resale value for existing phones, a phenomenon the reseller called a "trade-in black hole consumers should avoid." However, it also noted that after an initial rush to trade in iPhones for new models, the resale value of iPhones actually improve. Three months after the "black hole" in valuation depressed by the newest arrivals, Bank My Cell noted that "iPhone values trend upwards every January," pointing out that "the new iPhone XS/XR range and the iPhone X/8 saw trade-in price increases as we entered 2019." The excitement of new iPhone launches impacting trade in value isn't observed among Androids. Even for Samsung, the biggest spender among Android licensees in marketing and launch extravaganzas, the report noted that "when tracking the 2015-2017 Galaxy S6-S8 models, most only saw drops of between 5 percent and 13 percent in weeks following the March Galaxy S9 release." The ability of iPhones to retain their resale value has incrementally enabled Apple to offer more premium tiers of iPhones, because customers aren't paying full retail price to buy the latest models. Apple itself has worked to introduce its "Give Back" own trade-in program to help encourage buyers to spring for its best models, leveraging the value of their existing purchase. In December, sloppy hit-piece reporting by Bloomberg sought to conflate Apple's trade-in program with "price slashing," creating the false impression that Apple's profitable program for reselling refurbished iPhones was actually a desperate "fire drill" attempt to sell new iPhones. 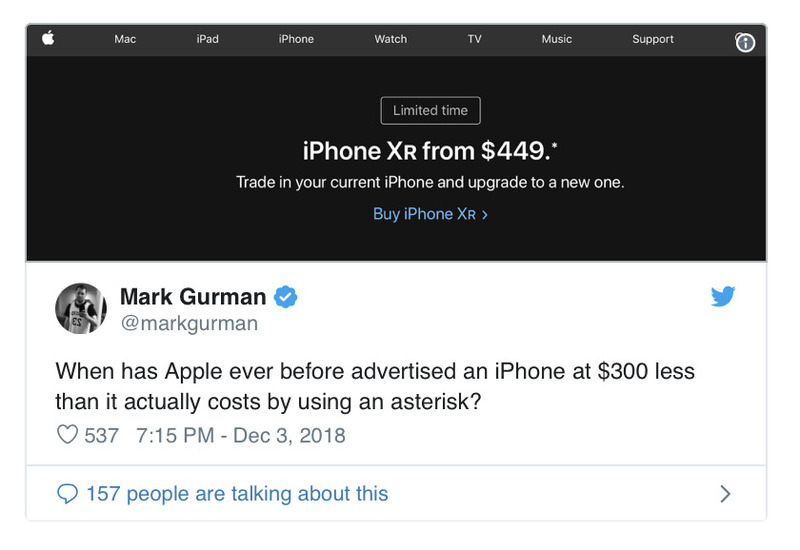 In a tweet, the author asked when Apple had previously "advertised an iPhone at $300 less than it cost by using an asterisk," promoting a media narrative that was gobbled up and spread around by a variety of tech columnists who were completely bamboozled by the concept of trade-ins or resale value. Pundits continued to be shocked when Apple announced efforts this spring to draw attention to the lengthened lifespan of iPhones, the only smartphones that consistently get multiple years of software updates and security patches. Up to that point, they positioned the extending lifespans of phones as a dire problem for Apple. Yet with iPhones retaining value for longer, customers who want to upgrade can afford to do so faster by taking advantage of the fact that there's a market for people who want to buy a second-hand iPhone. That results not only in an environmentally friendly longer life span for iPhones in general, but also a broader installed base, as older phones remain in use with new buyers who continue to pay for Services ranging from app subscriptions to Apple Music. The resale market for iPhones resembles the preowned market for luxury cars. If Apple were to produce low-end devices that were radically cheaper-- in the model of Chinese producers-- it might boost short term unit sales but would depress its ability to develop advanced products that other makers copy, and give up its position as the only smartphone maker generating the substantial profits that enable it to confidently invest in the future of silicon and other advanced technologies. Apple does a better job of getting used phones back in front of potential customers. If I look at a wireless providers phones, used and refurbished iPhones show up with new phones. Because Apple is trusted to refurbish phones into “like new” condition buying one is safe. Buying a refurbished or used Android is probably an eBay experience... it’s Russian roulette on quality. Additionally, Android manufactures have dropped the ball on the post sales experience, this shows up across the board, but especially in security and OS updates. I’m not going to buy a used 2 year old Android because I have no idea how long it will be supported. Poor resell value is no surprise. If I buy an Android it’s going to be new. The most likely reason to consider Android is if their high end phone is the same price as a one generation back iPhone. Well, that should not be a surprise -- because it ain't about the hardware. People, whether they realize it or not, are attracted to Apple products (except the watch 7 Airpods) due to their software and ecosystem rather than the hardware. Yeh, the hardware gets all the annual glitzy sales stuff, but its the software and the ecosystem that make them exceptional products and keep people coming back. And, 5 years from now the iPhone Xs will be running the latest and greatest software (iOS17) and exploiting Apple's most modern ecosystem while the Androids are hopelessly out of date and highly vulnerable to virus attack. Hardware wise they are fairly equivalent. So what makes the difference? Hint: The Lenovo can't run MacOS. I completely disagree with your assessment of EBay. I've been using them for years and find them to MORE reliable than any other online service. Yes, you have to be careful and check out both the product and vendor but after several hundred purchases I can say that I have only been disappointed twice - and both times EBay made the seller accept a full refund, postage paid, return while I have saved thousands of dollars. A big part of that are the seller ratings: I have never had a problem with a high volume seller with a 99+% rating. I buy everything from EBay: from parts to repair my old lawnmower, to stupid little items I can't find elsewhere to major purchases. My most recent purchase were some zipper pulls to replace a broken zipper tab on a favorite jacket. Before that it was a 2014 MacBook Air that runs perfectly -- $220. Apple isn't a startup or low profit company, so they can afford insane development cost without the need to get it back instantly or get it back at all (with a few hundred billion in cash), it could even multiply its development by 10 (or more) for free if they stopped burning astonishing amounts of money and instead spend it in a meaningfull way. I don't think seanismorris was suggesting EBay isn't reliable for purchases (I hope not - I agree that EBay sellers have been honest in my opinion). It's the contrast between buying a used phone on EBay vs. buying from APPLE itself. The level of confidence that a buyer gets from an OEM seller, even if it is a used device, is hugely valuable. The warranty alone is a massive selling point. Thus the creation of "pre-owned" programs at BMW, etc. to capture much higher resale prices for used cars than is typical. This is especially hard for others to emulate. Beyond software (as others have already noted), there is the Apple Store and Applecare. Both of these operate to encourage high quality repairs and act to allow close monitoring of quality (for current and future improvements). A phone that has been serviced entirely by Apple is much easier for Apple to confidently resell to someone else with a warranty. I'm always amazed how well Apple idevices keep their value. I don't live in the US so my experience is different due to VAT, smaller size of the market and different competition but the difference between buying an S9 the day it's released - usually at the expensive retail chains - and buying it a month or two later when smaller, cheaper, but still reputable online stores get in the game is huge. On launch date, the S9 cost about $1200, a month later it was $800 and $600 today. If you're someone willing to buy on day one, you're probably not worried about resale value. Anyone else would wait and then the difference a couple of years later isn't as dramatic as portrayed in this article. For comparison, a similar iPhone X went from $1500 on launch day, up to $1600 a month later and then slowly came down to $1000 today. I don't know what resale prices are like here but even if your $800 S9 went down in resale value by 70%, paying that much less up front makes up the difference and then some. Really AI? An entire article about a president misstating Tim Cook’s name? And then closing comments again? I come here for Apple, not petty partisanship. Just cancelled my AI subscription. Did you know? Water is wet? This isn't new really -- iPhones (and Macs) have a longer useful lifespan, AND command better re-sale value. The knockoffs just become junk in a drawer. People, whether they realize it or not, are attracted to Apple products (except the watch 7 Airpods) due to their software and ecosystem rather than the hardware. That's opinion presented as fact tho, and cannot be sourced. It's both. Some people, like John Gruber, prefer the software -- he'd run iOS and Mac on knockoffs or PCs. Other people like the hardware foremost -- Apple popularized industrial design, and their hardware form factors are sleek and minimal, perfect for those of us who want the keep it out but hate the trashy look of tech-gear. Apple's design ethos made it "living room tech" -- stuff you don't mind leaving out at all. And is small, lightweight, easier to travel with...etc. It's both. And only Apple has complete control of both its hardware & software. Ooh ooh -- does that mean we don't get to look forward to your posts chastising women in tech anymore!? But, you can get all of that through EBay as well. Many think it is only hucksters selling used and broken equipment. When I bought an SSD on EBay, and later some Google Mesh routers, I was surprised when they came from Best Buy. You mean my gold Rolex will retain its value more than my Fool's Gold replica?!?! To be fair, the articles were less about tech and more political. Feminism has nothing to do with tech but Tim Apple was there. Chastising is the word people throw around when men want equality. Where do they sell macOS off the shelf? You can't -- and that was my point. That, and the Apple ecosystem is the difference between a MacBook and any other high end laptop. Lol. Are you joking? Please point out where I came even close to chastising women in tech. This call out culture and petty identity politics I think has run it's course. I'm pretty sure we'd be all better off talking about actual issues rather than making baseless accusations that contribute nothing to the conversation. Yeah no. IMO my iPhone X is still better. And as far as my MB, its storage and RAM were faster due to not being stock modules. And the trackpad is unrivaled. And the screen. And I still love the shell form-factor, so... IMO your opinion is again not fact. As for the alternative universe where there is no macOS or iOS, I rather don't see the point of that sort of role playing. You don't remember the big discussion we had on an article where women in tech was an issue, and I bailed out after dealing with so many triggered snowflakes, and then you started messaging me personally via PMs, and I had to ask you to stop, and you wouldn't, so I said I was going to alert the admins if you didn't? I do. Shrug. Anyway, if you're quitting AI over the Tim Apple story, then I guess you won't have to worry about identify politics anymore, right? What you prefer is not the same as what is superior technically. I like matt black more than slippery aluminum. That doesn't make it technically superior.